There are two types of donor tissues which are used in surgery. The sclera, or white portion of the eye; and the cornea, which is the clear lens at the front of the eye. The cornea is the clear lens at the front of the eye which focuses light onto the retina. Damage or disease to the cornea may cause it to change shape or become cloudy. This can cause pain, distorted or blurry vision. Corneal transplant replaces the damaged or diseased with a healthy donor cornea. The full thickness of the cornea is transplanted in this procedure. This procedure involved replacing the front layers of the cornea, the epithelium and stroma. The sclera, or white portion of the eye, may be used in a number of different surgical procedures. Portions of the sclera, or grafts, are used. There can be up to eight six sclera grafts from an eye donation. 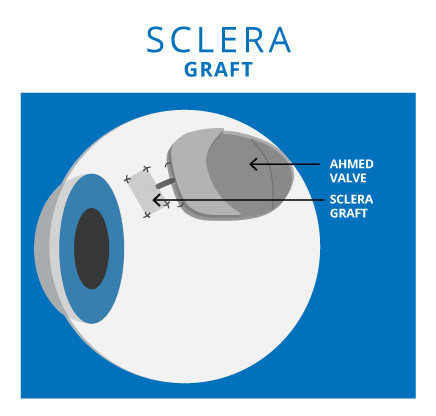 A graft, or patch, of sclera may be used over the tip of a pressure release valve (Ahmed Valve) during surgery for glaucoma. A prosthetic (artificial) eye may be implanted using donor sclera. The prosthetic is wrapped with sclera and the four muscles which move the eye are reattached to the donor sclera. This allows the eye to move in unison with the natural eye. Donor sclera may be used in eye lid reconstruction.